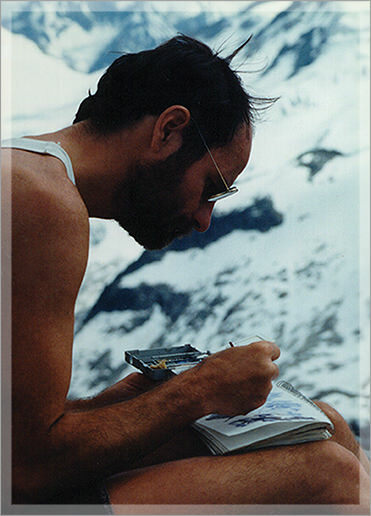 Jim Less (pictured) painted the mountains of British Columbia for two decades just prior to the rise of the Internet and therefore web searches about him produce little. A book of his art, with text by Michael Collins, aims to fill a missing gap by providing a glimpse into Less's life and work. Jim Less: The Mountains of Western Canada (Self-published $95) is largely composed of reproductions of Jim's paintings with some biographical detail from Collins. Jim Less was born in Clinton, Iowa on April 17, 1951. Shorty after receiving a degree in chemistry from Michigan Tech University, he emigrated to Canada. When Jim first got to the country he wanted to do some exploring, and in the summer of 1974 Jim and Michael Collins met an old bush pilot named Ralph Hathaway, then living on Vancouver Island. Hathaway told them about a place called Trout Lake in the middle of the Selkirk Mountains of the southeastern interior of British Colombia. Once there Less and Collins travelled up the road alongside Lardeau Creek to Ferguson, a community which had thrived in the early years of the 20th Century until the price of silver collapsed in the wake of World War I. Afterwards, the place became a ghost town, reduced to seven standing buildings with the rest of the townsite surrounded by meadow, forest and mountains. It is here that Jim Less made his home. He took teaching jobs away from Ferguson, in Prince Rupert, Mt. Curie, Revelstoke, the Okanagan, and various other locations in British Columbia, but as time went on he was able to devote more and more of his life to painting.